Experience the majesty and adventure of diving and exploring the ex HMAS Canberra artificial reef and dive wreck in Melbourne, Victoria, Australia. The ex HMAS Canberra dive site was opened for diving on Saturday, 5 December 2009. Join seals, seahorses and stingrays on a dive below the waves of Bass Strait. Explore the decks and galleys of the wrecked HMAS Canberra, an artificial reef created for the sole purpose of diving. The ex HMAS Canberra dive site lies in approximately 28 metres (92 feet) of water, with the top of the mast about 5 metres (16 feet) below the surface at low tide. The site provides opportunities for divers with varying levels of experience and certification, from open water level certificates to advanced wreck divers, to enjoy this site. Book a two hour time slot on the public mooring through Parks Victoria. Divers are able to access the superstructure of all decks. Highlights are the junior mess mural, the captain's cabin, the bridge, galley, mess decks and operations room. These areas have been left as intact as possible to create additional interest for divers, plus nooks and crannies for creatures. Please note that this can make the dive more challenging. Ex HMAS Canberra Shipwreck from Alan Beckhurst on Vimeo. To see the whole 138.1 metres (453 feet) long, 14.3 metres (47 feet) beam, 4,200 tonne (4,630 short tons) displacement ex HMAS Canberra FFG-02 ship, you'll want to do at least 20 dives. However, you can certainly get a feel for the majesty of the wreck after even a few dives. Wreck diving is a challenging recreational experience. Do not over-estimate your competence and skill level. Wreck penetration should not be attempted without proper training and equipment. It is recommended that all divers first do an orientation dive on the ex HMAS Canberra Wreck/Reef to become familiar with the complexities of the Wreck before venturing into any compartments, regardless of their level of skill or experience. Please don't scavenge from the ex HMAS Canberra. It's illegal. Plus, if you do, it won't be long before you destroy the thing you came to see. Depths are measured at the lowest astronomical tide Rip Bank Datum adopted as 1.460 m below AHD. Depth values are in metres. These deck plans show the various compartments of the lower decks 3 and 4. The X symbols mark where explosive charges were used to create openings through the hull to scuttle the vessel. ex HMAS Canberra FFG-02 3 Deck. ex HMAS Canberra FFG-02 4 Deck. Roll — The wreck sits with a list to starboard of an approximately 25 degree angle. 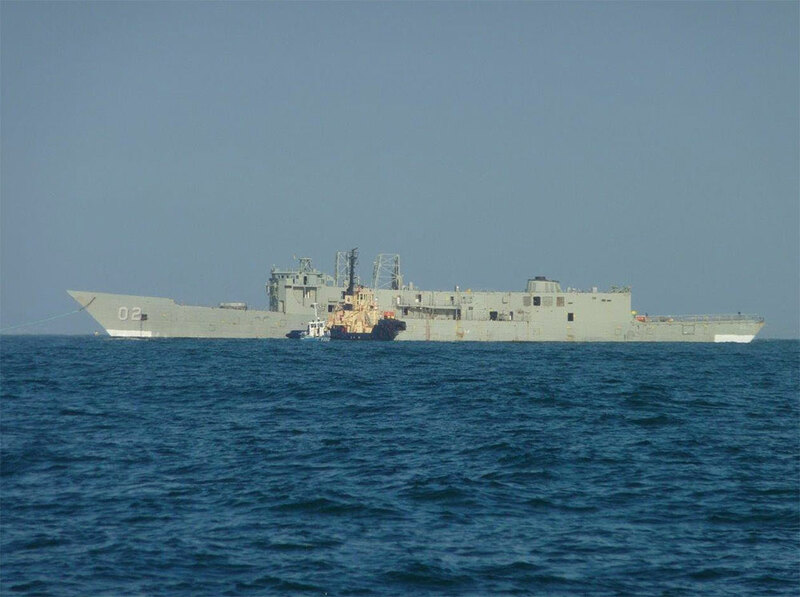 The scuttling of the ex HMAS Canberra followed a period of extensive consultation with stakeholders and regulators to determine the scuttling site, environmental requirements for vessel preparation, scuttling procedure and monitoring program. Parks Victoria initiated an ongoing ecological monitoring program to identify and manage potential marine pest colonisation of the wreck and inform stakeholders of the progressive colonisation of the wreck and any changes to local ecosystem values. As creation of ecosystem values were listed as an objective of the project (through creation of an artificial reef), an ecological monitoring program was required by the Commonwealth Department of Environment, Heritage and the Arts who issued the Sea Dumping Permit. Parks Victoria commissioned CEE to undertake 6-monthly ecological monitoring of the wreck for 2 years post-scuttling. The first report describes the aims, scope and methods of the marine ecosystem monitoring program. It is an interim report for the 2, 4 and 6 month post scuttling pest inspections and the 6 month post scuttling ecosystem assessment. See The ex HMAS Canberra Marine Ecosystem Monitoring Program: 6-Months Post Scuttling (Adobe PDF | 2.54 MB). Parks Victoria has responsibility for ex HMAS Canberra site management. 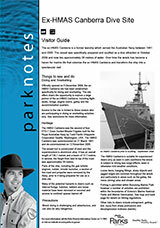 See the Visitor Guide, or visit https://parkweb.vic.gov.au/explore/parks/ex-hmas-canberra-recreation-reserve, for more information. 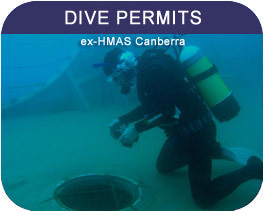 All divers wishing to access the ex HMAS Canberra dive site must hold a current and industry recognised entry level qualification (equivalent to Australian Standard AS4005.1), as a minimum level of certification. The site is not suitable for inexperienced divers unless accompanied by a suitably qualified guide. Ultimately it is your responsibility to be satisfied that you are appropriately trained, certified and experienced in Victorian conditions to undertake the planned dive. If you are diving the ex HMAS Canbrerra via a Charter Boat Operator or Dive Shop then they will provide you with details of the dive site guidelines they use on the dive site. Each operator may have their own unique requirements about the dive certifications and experience they expect you to have in order for them to allow you to do penetration dives. Please ask them about this when making your booking. A dive permit is required from Parks Victoria for all independent recreational dives at a cost of $30 per vessel. Permits are available for a maximum of two hours (except after 10pm). The permit allows use of mooring number 2 only. You will not need a permit if you book your dive on a dive charter boat through a licensed tour operator. Private boat permit bookings can be made online 24x7 via the Parks Victoria web site at www.parkstay.vic.gov.au/ex-hmas-canberra-reserve. 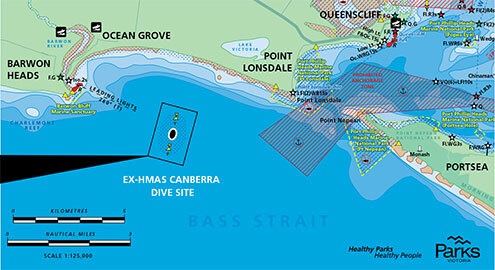 An ex HMAS Canberra Dive Site Map (Adobe PDF | 617.63 KB) has been produced by Parks Victoria. 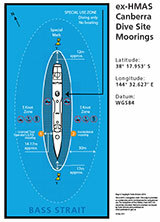 The first page shows the location of the dive site and details of the moorings. The second page shows the Starboard View, Port View, and Top View of the vessel with the diver entrance and exit points clearly marked. On 19 October 2009, shortly after the ex HMAS Canberra was scuttled on Sunday 4 October 2009, The Port of Melbourne Corporation conducted a Post Scutling Survey of the Ex-HMAS Canberra Dive Site. They produced a detailed A0 sheet size chart — ex HMAS Canberra Scuttling Survey (Adobe PDF | 4.8 MB). Printed full size it makes for an amazing wall poster. See the Parks Victoria — Ex-HMAS Canberra Recreation Reserve web page for more information. The ex HMAS Canberra dive site is clearly marked by two special mark buoys and two mooring buoys. Parks Victoria has put in place a two buoy mooring system to make diving the ex HMAS Canberra Reef easier and safer. Commercial operators use mooring number 1, and there is a recreational (public) only mooring number 2. 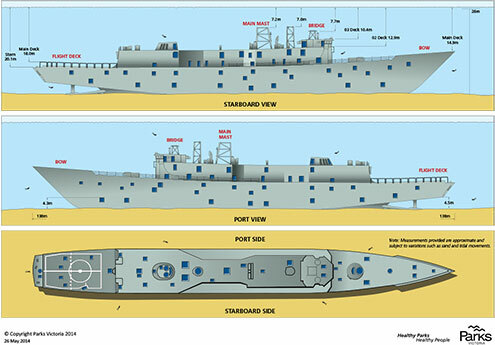 See ex HMAS Canberra Dive Site Moorings Diagram (Adobe PDF | 589.26 KB) for a useful information sheet private boat operators can print out, laminate, and then use to locate the dive site and use the public mooring buoy. Before approaching the diving area, try to communicate with any vessels already there, ideally by radio, or by giving the OK signal. They should tell you how many divers are down, approximately where they are, and where they are expected to surface. ex HMAS Canberra Reef dive moorings are likely to be popular at certain times. Be prepared to wait until your allotted time slot. Agree a plan of action with any other dive boats present. Approach the site at reduced speed (less than 5 knots), especially if there are other vessels already at the site. At all times, only motor at very low speeds in the vicinity of the dive site. There is a No Boating Zone above the dive site, located within the area defined by the navigation marker buoys and mooring buoys surrounding the dive site. Do not motor unnecessarily or patrol the area, it adds to the danger. Maintain a constant vigilance for divers in the water and the potential for divers ascending from the site while underway. It is possible some divers will be using rebreathers and will not be easy to locate due to lack of bubbles. Never go near divers' bubbles with your engine in gear. Never drop your anchor or shot line within 100 metres of the dive site. While moored, a person with a Victorian Boat Licence must be in the boat at all times. Use any permanent entry (descent) lines and exit (ascent) lines that may be available. Before engaging your engine, check for bubbles. Look all around your boat including the stern. Never manoeuvre at more than tick-over until you are a considerable distance from the dive site. Divers may come up away from the site, especially down tide. 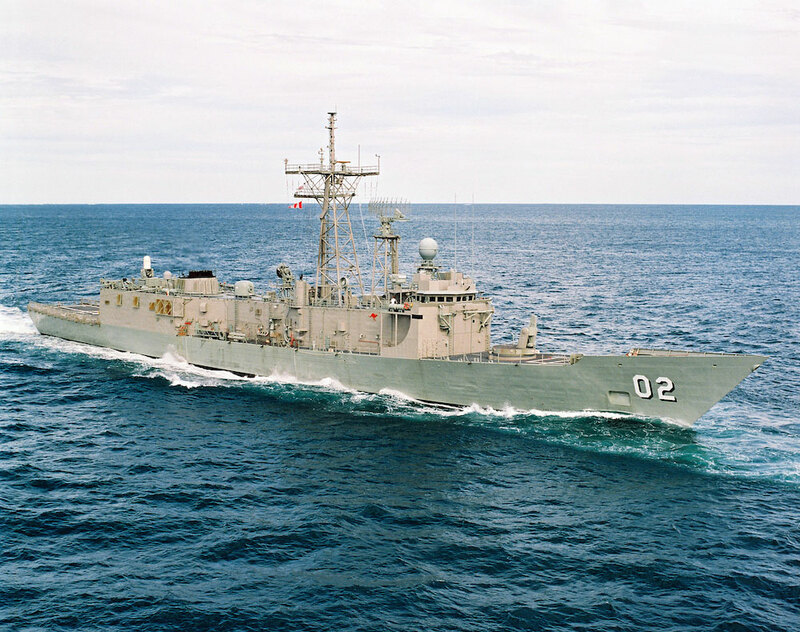 HMAS Canberra (II) was the second of six Adelaide class guided missile frigates (FFG) built for the Royal Australian Navy to the design of the American Oliver Hazard Perry class. The keel of Canberra was laid on 1 March 1978 and the ship launched on 1 December 1978. 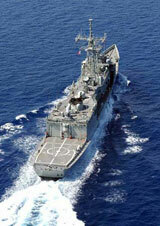 Canberra was commissioned in Seattle on 21 March 1981. 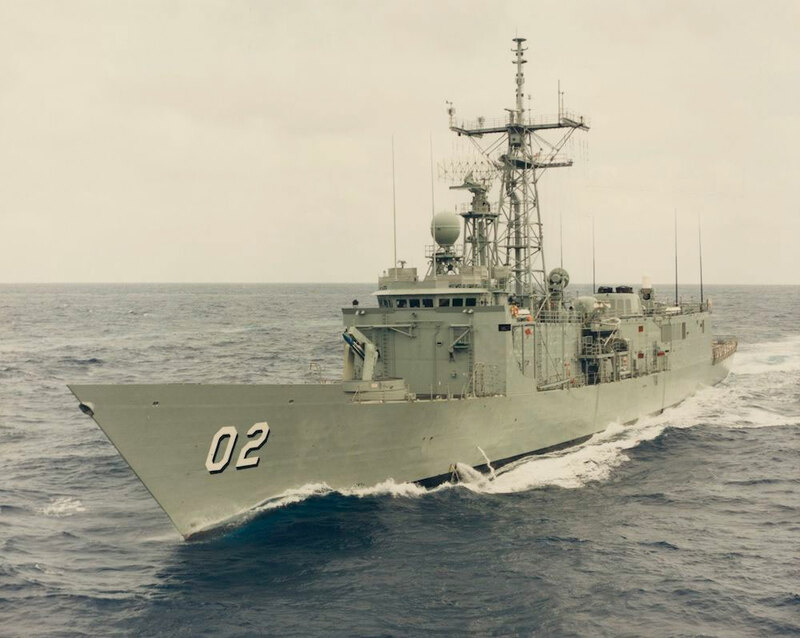 Following successful trials off the United States west coast, Canberra arrived in Australian waters and her new homeport of Sydney in March 1982. The HMAS Canberra (II) FFG-02 and her five sister frigates (HMAS ships Adelaide (II) FFG-01, Sydney (IV) FFG-03, Darwin FFG-04, Melbourne (III) FFG-05 and Newcastle FFG-06), were the first Royal Australian Navy (RAN) ships to be powered by two computer controlled gas turbine engines operating through a controllable pitch propellor for their main propulsion. This gave the ships high manoeuvrability and the ability to be "on-line" in less than one eight of the time required by steam turbine ships. As built, she displaced 4,100 tonne (4,519 short tons) and measured 135.6 metres (445 feet) in length with a beam of 14.3 metres (47 feet). Two General Electric gas turbines generated speeds in excess of 30 knots. The hull length was marginally increased to 138.1 metres (453 feet) and displacement to 4,200 tonne (4,630 short tons) in 1990/91 during a major refit that included a strengthened flight deck pending the introduction into service of Sikorsky S-70B-2 Seahawk helicopters. Video montage of HMAS Canberra FFG-02 photos. The HMAS Canberra's role was to operate with other maritime forces to help keep the world's sea lanes open and free by providing protection for military and merchant convoys. To achieve this she was specifically designed to simultaneously counter the threats posed by submarines, air, surface and subsurface launched missiles and enemy warships. 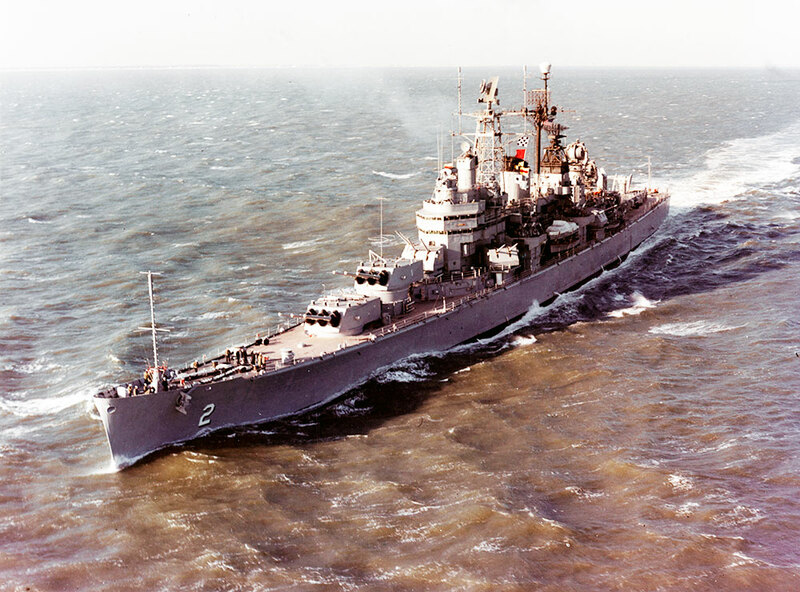 Accordingly, the ship was fitted with long range radar, sonar and electronic surveillance sensors which were co-ordinated by high speed computers to provide data for the ship's weapon systems. HMAS Canberra's main armament consisted of shipborne and helicopter borne torpedo delivery systems, one 76 mm rapid firing gun, Harpoon anti-ship missiles, standard surface to air and surface to surface guided missiles, the Phalanx close in weapons system, two triple mounted anti-submarine torpedo tubes, and electronic decoy devices. This weapons fit was intended to provide an in-depth defence for both the ship and the force or convoy she was protecting. Her average ship's company was 186, however, this increased to around 210 on those occasions when two Seahawk helicopters were embarked. Canberra and her sister ships were primarily used as long-range escorts fulfilling multiple roles including air defence, anti-submarine warfare, surveillance, interdiction and reconnaissance. They were also capable of countering simultaneous air, surface and sub-surface threats. Canberra relocated to Western Australia in January 1996 from where she enjoyed a higher operational profile, actively supporting Australia's national interests and the Federal Government's domestic and foreign policies, particularly in light of increased regional instability and world events. 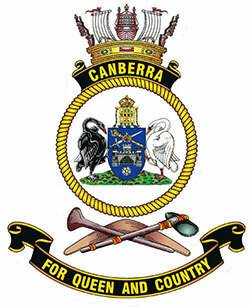 The name Canberra has a proud history. In 1925 the Australian Commonwealth Naval Board selected the names Australia and Canberra for two new 10,000 ton Country Class Heavy Cruisers under construction in the United Kingdom. 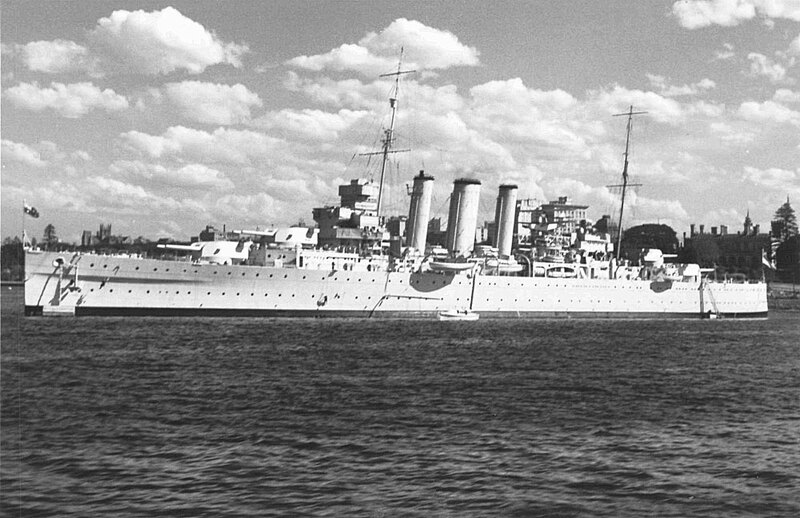 The first HMAS Canberra duly commissioned in Scotland in July 1928 and was Flagship of the Australian Squadron from 1931 to 1940. She was sunk diring WWII, with the loss of 84 lives, following the Battle of Savo Island on 9 August 1942. At the request of President Franklin Roosevelt, an American cruiser was named USS Canberra in 1943 in honour of her Australian forebear. USS Canberra_(CA-70) served until 1947, was converted to a guided missile cruiser in the 1950s and completed five tours of duty in Vietnam before decommissioning in 1970. The bell of USS Canberra was gifted to Australia in September 2001 to mark the 50th anniversary of the ANZUS Alliance, and can be seen on display at the Australian National Maritime Museum in Sydney. 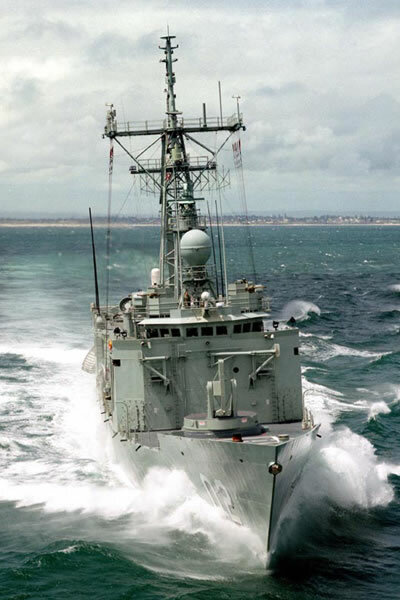 HMAS Canberra was the first Adelaide Class Guided Missile Frigate (FFG) to be decommissioned which occured at the Fleet Base West, Rockingham, Western Australia on the 12th of November 2005. She was scuttled at 14:00 on Sunday 4 October 2009 in 28 metres of water off Ocean Grove, Victoria to create an artificial reef and diving site. 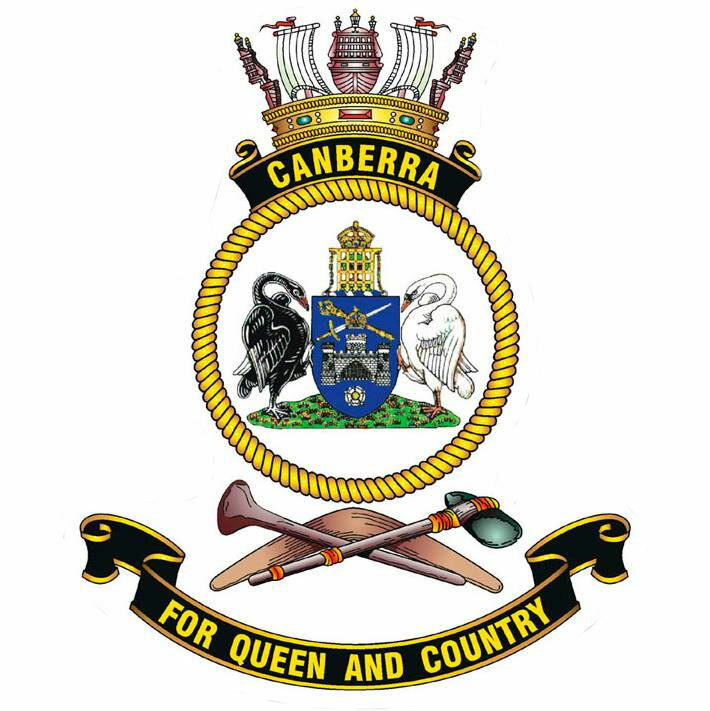 You can learn more about the HMAS Canberra's history, and the Royal Australian Navy personnel who served in HMAS Canberra FFG-02, at www.hmascanberra.com. See also Wikipedia: HMAS Canberra (FFG_02), and Royal Australian Navy: HMAS Canberra (II). Motto "For Queen And Country"
Adelaide Class Guided Missile Frigate (FFG), 138.1m, 4,200 ton. Built: Todd Pacific Shipyards Corporation in Seattle, Washington, USA. Scuttled: 2 pm on Sunday, 4 October 2009. Depth: 4 to 32 m.